IBM SPSS Modeler is a powerful, versatile data and text analytics workbench that helps you build accurate predictive models quickly and intuitively, without programming. 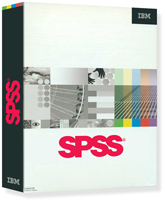 Easily visualize the data mining process, using IBM SPSS Modeler's intuitive graphical interface. From this interface, you can easily access numeric, tabular data from a variety of sources, along with text, Web 2.0 and survey data, and use modeling to improve business outcomes in areas as diverse as customer relationship management, marketing, resource planning, fraud and risk mitigation, medical research, law enforcement and national security. Produce deeper insight and more accurate predictions by utilizing all of your data assets to create a complete view of your customers or constituents. IBM SPSS Modeler now integrates with Cognos Business Intelligence software, as well as with a wide range of databases, spreadsheets and flat files -- including IBM SPSS Statistics, SAS and Microsoft Excel files -- and on a wide range of platforms.